It’s here. And it’s unbearably sweet, or at least it approaches unbearable sweetness. Spring is the dandiest season, and we wring every drop of enjoyment out of it, we’re so hungry for it. We savor. We luxuriate. We revel in spring. Perhaps we’ve earned this right, after making it through one more winter. Winter here in Nebraska is always rough enough on us, and long enough for us, that we spend weeks (months, in little Mack’s world) longing for it. Craving sunshine. Searching the landscape, hungrily, with our eyes, for color. Yup. That’s my boy. We all need some greenness in mid-February. And mid-March. And here, in mid-April, we finally see just a bit of greenness. Winter is charming at first, with the sparkle to the air and the promise of snow and ice, and the crowding about the wood stove for warmth and companionship and the hot soups and endless steaming cups of ginger tea and the sledding and skating afternoons on the pond and the chapped cheeks and the hot chocolate afterward. But it gets old and tiring, after a time, and universally we believe that it hangs on too long here in Nebraska. Quite simply, winter outstays its welcome. We long to really stretch our legs outside, to hear the birds again, to spend entire days outside with our hands in the dirt and our minds pleasantly busy. Or empty, depending on our mood. Willa Cather and I, I’m sure, would have been kindred spirits. 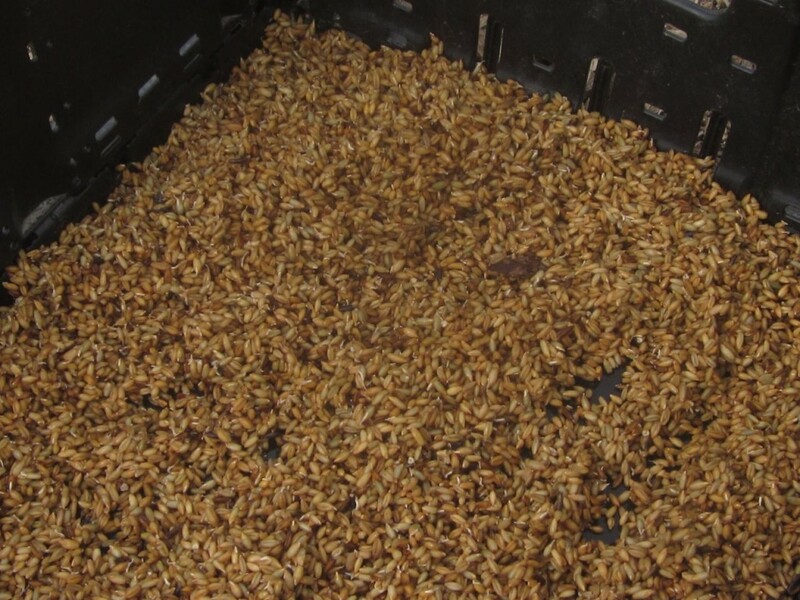 Although it is perilously dry here, and much of the world is still brown and barren, there are signs of life everywhere. Thank God, who made Spring. And winter. And little boys. And big mamas. Spring is coming, after all. 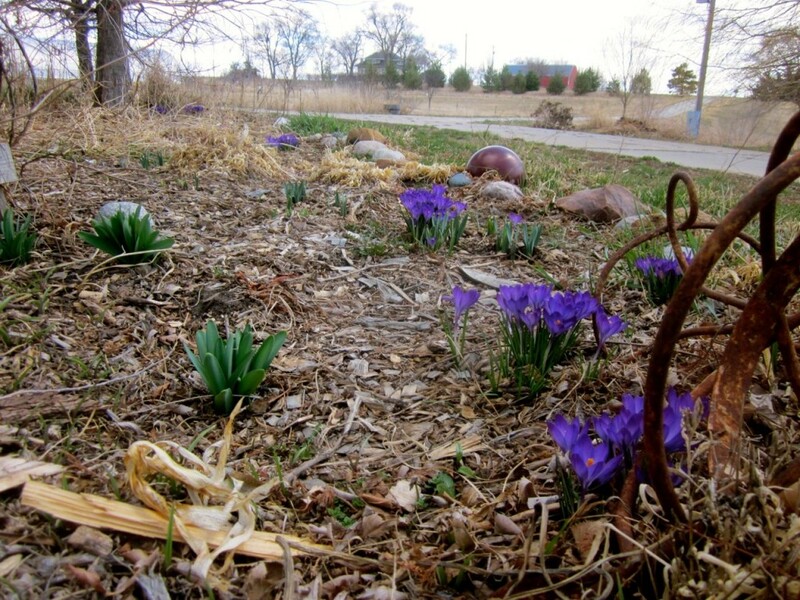 The first flowers to pop out of the dry ground at our place are the crocus. 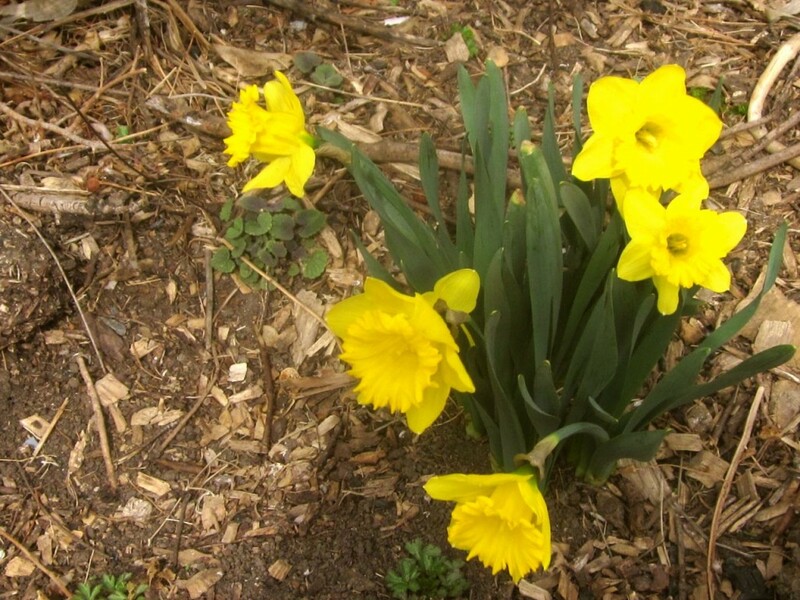 I think the day that we discovered these daffodils blooming, little Mack and I stood and stared at them for a solid five minutes. Inside the house, are surefire signs of spring, too: baby tomato plants! Yup. 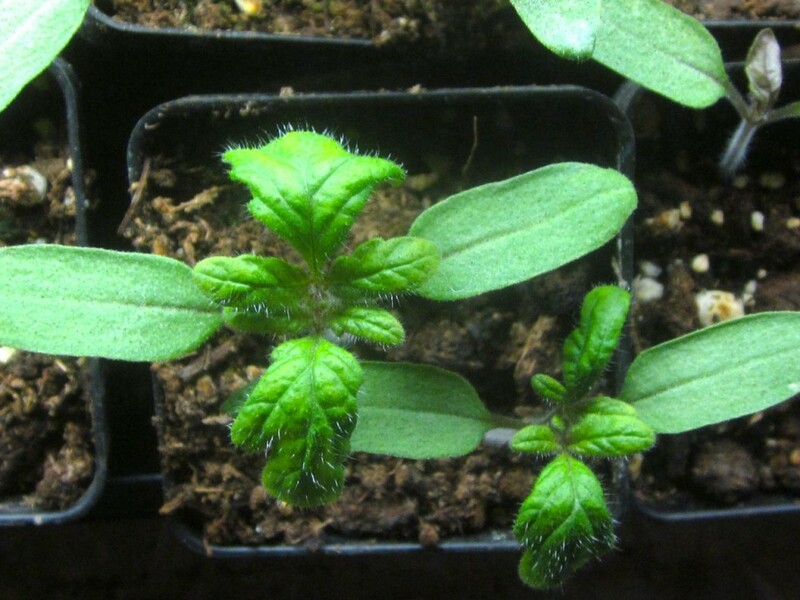 Little hairy baby tomato plants. I pinch their leaves every day–gently, gently, after all, they’re just babies!–just to smell that luscious tomato smell. Not to mention, in the hoop house. 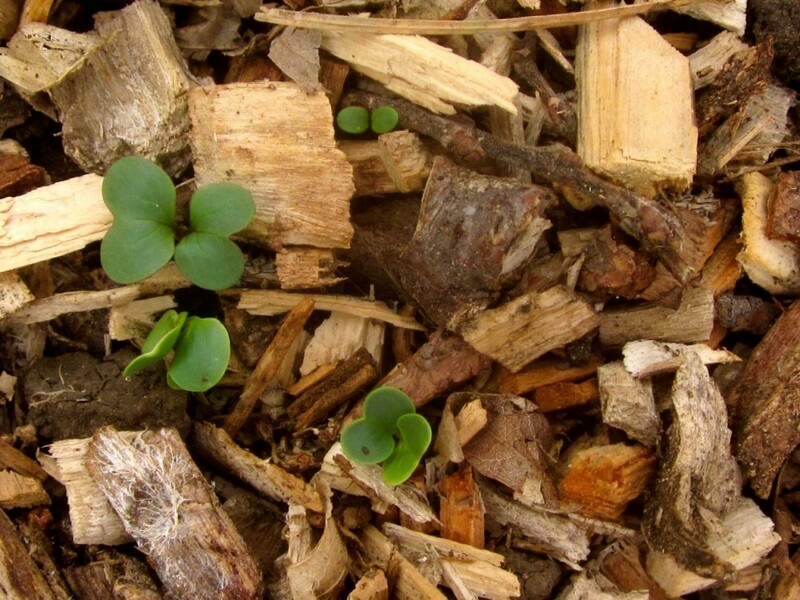 Oh, so cute–baby radishes in the hoophouse! The chickens are greedy for green, too, and wait anxiously at the gate every afternoon, for me to let them out. I’d let them out to free range all day long, except that the grass is still very slow to grow and sluggish (it’s hungry for rain, too!) and I’m afraid they’d just clip it all to the roots, and then where would we be? Grassless . . . 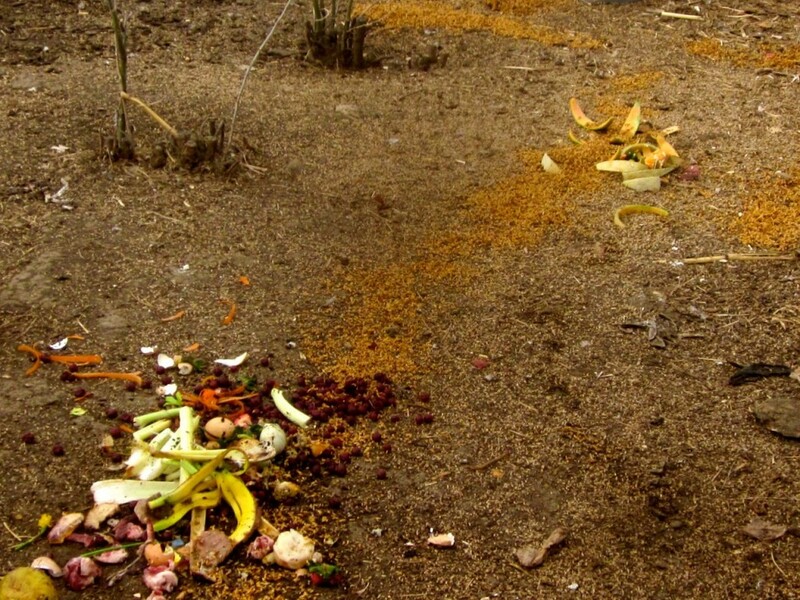 This is the early morning chickens’ buffet: a trail of sprouting grains, with kitchen scraps. The farmers in our area have cleaned out the trees and brush that used to be growing on our shared property line, and have put up a very stout 5-strand barbed wire fence, instead. The trees and brush were a good windbreak. The fence, not so much. The first day it was up, both dogs had to learn to navigate it, and Ollie got into trouble. He had been used to running across into the fields around our place without any fencing at all to stop his mad joyful bounding. He evidently ran full faced into the fence, cutting a line down his nose and two small (but deep) cuts just inside his eyes. Poor fella. I’m glad it didn’t get his eyes. We’ve all had some rather narrow escapes lately. Our poor Ollie. So glad the barbed wire missed his eyes, although just barely! That’s how far apart the barbs are. I’m hoping the hair will grow back, but it doesn’t show signs of it yet. He has learned his lesson, and hopefully he won’t have to learn it again . . . and again . . . and again. Actually the first day of The Big Fence, he got trapped in the farmer’s field and couldn’t figure out how to get back across to our yard. Don’t ask me how he got over there. After dark, I heard him yelping forlornly. I went out to the fence, where he sat sadly on the other side, told him to sit and then to lie down, and I pulled on his collar and helped him shimmy back underneath the fence. The stinging nettles don’t care how dry it has been all winter: they are coming up in great profusion, and I’m glad. I’ve missed having them for my green smoothies. 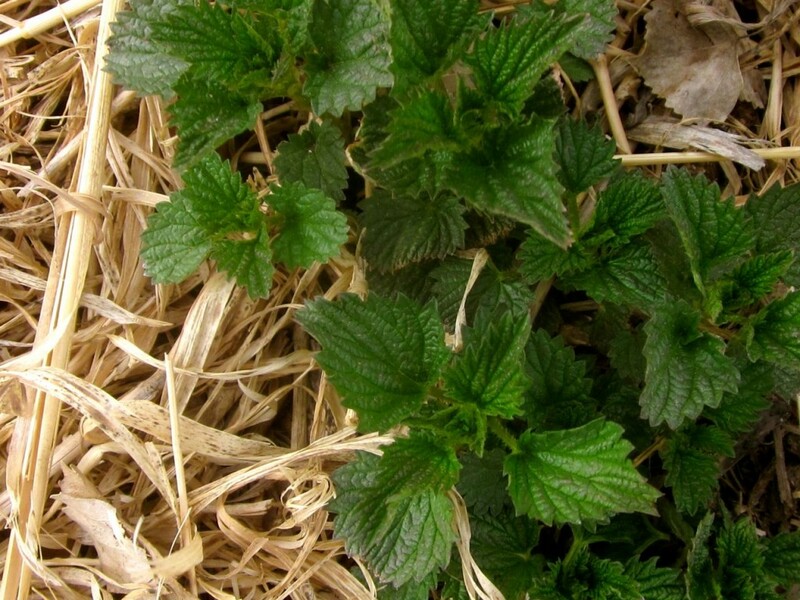 Did you know that you can eat stinging nettle leaves? They’ve been consumed for centuries. They were used primarily as a diuretic and laxative in ancient Greek times, and are believed to be a blood purifier and good to combat inflammation. It always strikes me a bit odd, that I can eat something that I can’t touch. 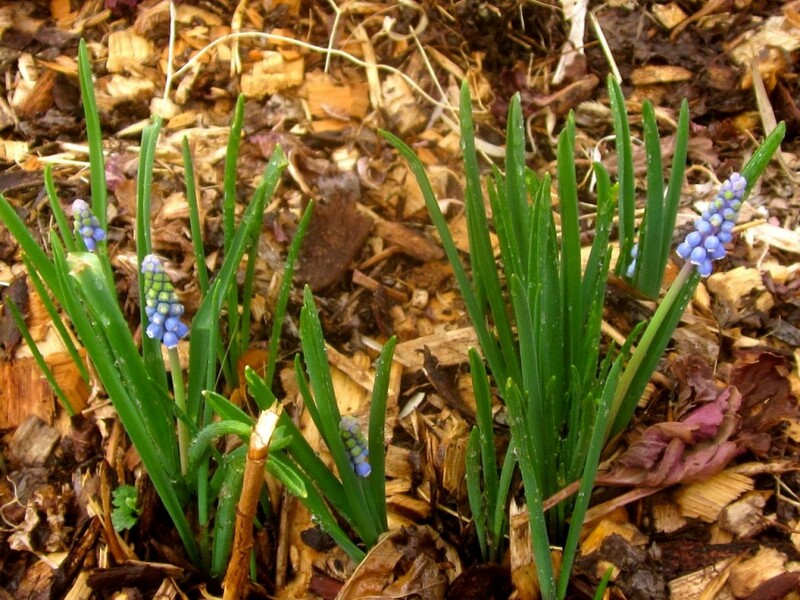 These little grape hyacinths came up early in my hoophouse. They piggybacked a ride into a flower bed with some mums that my mom gave me. They are so sweet. 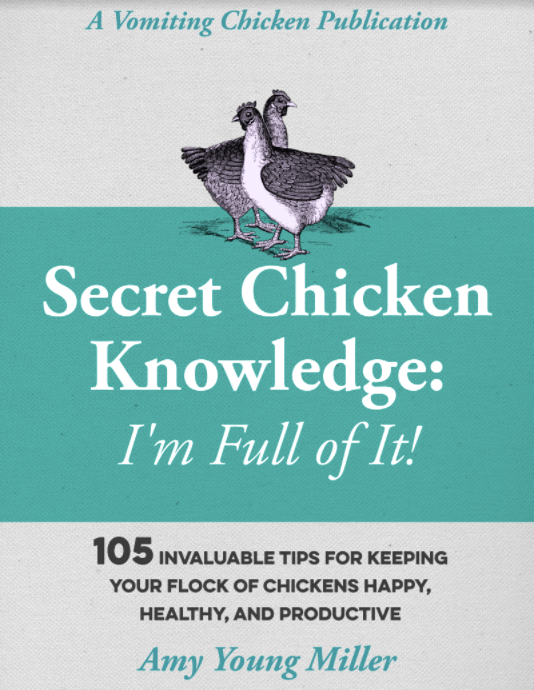 Okay, so I can’t wait any longer: here’s the secret. It’s a little hard to tell what this picture (below) is, because I very badly didn’t want to disturb the subject. It’s my goose Lucy, and she’s sitting on eggs. But not her own eggs. Her own eggs would not be fertile, since we do not have a gander (a male goose). I discovered that she had made a nest behind a board in the nursery area of the chicken coop (a highly desirable spot for the chickens to lay their eggs), and had claimed a clutch of chicken eggs for her own. Included were a few of her eggs, so I removed them and left the (undoubtedly fertile) chicken eggs for her. This is an experiment. A secret experiment. I so hope it works. I’ve heard of ducks who have hatched chickens, and hens who have hatched out ducklings, so I’m hoping that my broody goose will be able to hatch chicks, and then mother them, too. 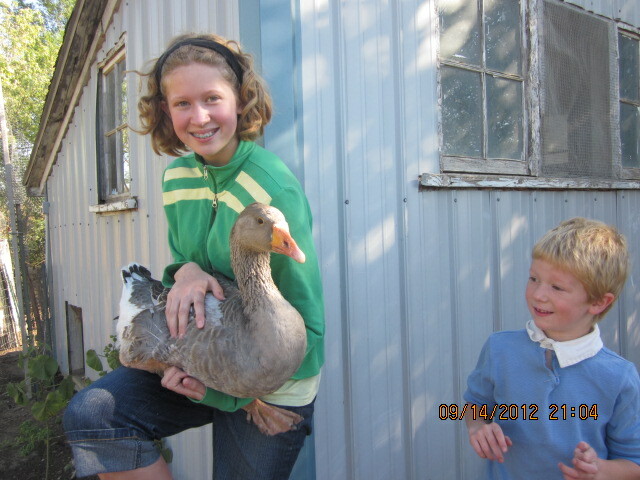 She hatched out goslings years ago, when we still had a gander. I’d dearly love to watch her be a mother again, and it would be sweeter than sweet to see her with a clutch of chicks, don’t you think? Especially since she so wants to be a mother, and her own eggs just won’t do. Of course her leading them to the water will be confusing for all concerned, but since Lucy isn’t sure if she’s waterfowl or chicken, I think she probably can handle it. Lucy’s story is a confusing one . . . friends gave her to us when she was a gosling, along with a few chicks, and we raised her in the chicken coop with the chicks. Then my dad and my sister gave me a baby gander for a birthday present, and we named him Seamus. 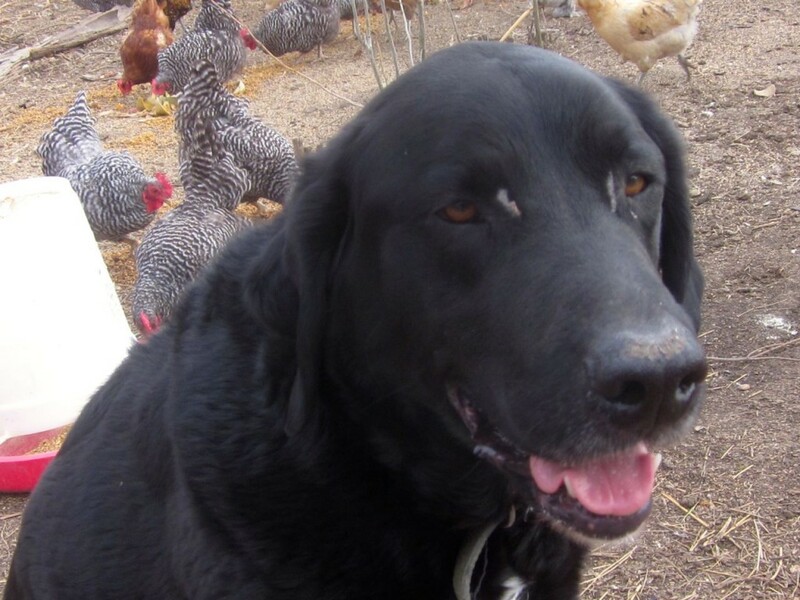 He and Lucy went on to raise a couple of families, and to live in the duck coop, on the other side of our place from the chicken coop, and close to our little pond. Amalia holding Lucy, and little Mack. While a couple of geese on the homestead are charming, a whole yard full is not, so we sold the young geese when they were big enough, but kept one baby (Blossom) for company for Lucy. But then Seamus came to an untimely end, and a couple years later (the year of the Dreaded Varmint) poor Blossom was murdered, as well. The day after Blossom disappeared, Lucy moved back in with her cousins, the chickens, and she has been there ever since. She eats and drinks and sleeps and hangs out with the chickens. 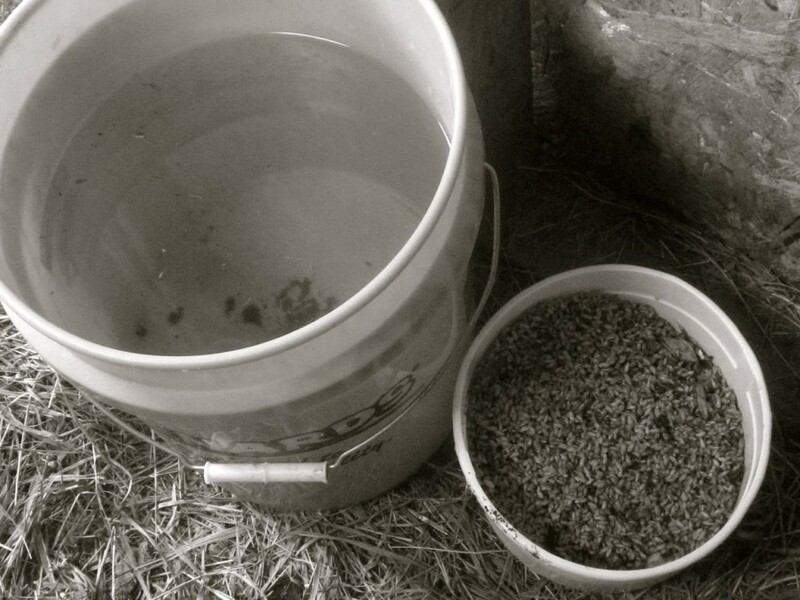 I provide enough water in the chicken yard that she can take a bath in one of the buckets, to satisfy her goosey heart. So maybe it’s not such a stretch to believe that she can be a mother to some chicks? Don’t mind me, Lucy. Just taking a quick photo. We’ll see. I’m keeping my fingers crossed, figuratively speaking. In any case, Lucy has earned the right to have the nursery to herself, and also her own food supply for the next three weeks or so. 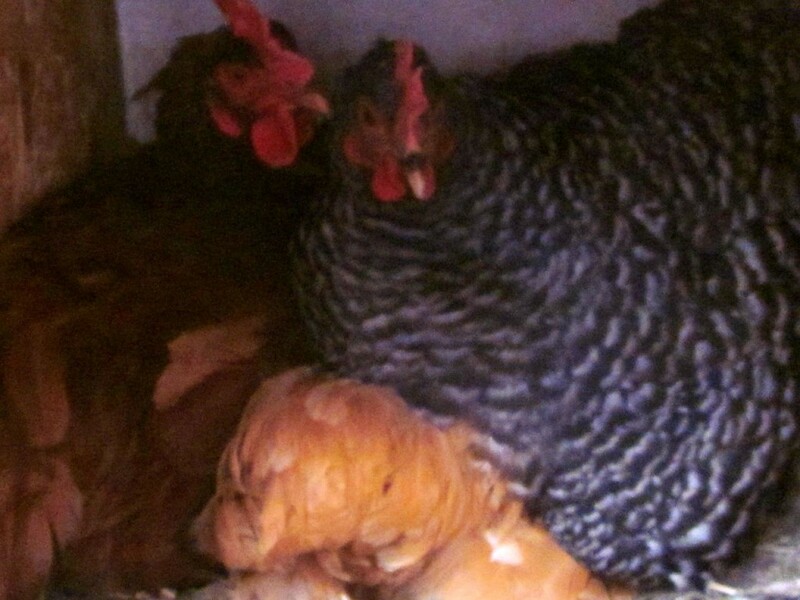 These three hens are all broody, too. When I was picking up eggs, they were fighting for the right to sit in this desired nesting box. The funny thing is: there are no eggs beneath them. But they sit there in their broody trance, all three of them jostling for position. I don’t know whether to call this photo “Dumb, Dumber and Dumbest” or “Larry, Moe and Curly.” I’m a little worried about the well-being of Butterscotch, the little bantam on the bottom. Maybe after Lucy is finished with the nursery, I’ll pick one of these broody hens to give it a go. They certainly are determined, but I’ve only got one Sitting Room. I wouldn’t mind not having to raise chicks myself this spring . . . Thank you, Gentle Reader, for checking in with me today. I do hope that spring is bursting out all over at your place by now, and that you are able to take some time to enjoy it! Oh! Two quick things before I take off to do some more planting . 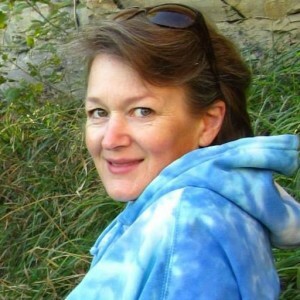 . . I’m sharing this post with the great folks over at The Prairie Homestead’s weekly Barn Hop, and I’d love it if you popped in, too. ← Crumble-topped Bacon & Cheddar Muffins: oh my! Now why did you go and tell me this, you know I can’t keep a secret…….Love the flowers. Let us know about the duck that hatched chicken eggs. This past Jan. In Mexico we had a case of a chicken that wanted to raise some baby chickens but could not product any so we actually went to one of my wifes sisters a few blocks away and got 8 eggs from her chickens. Not even the same type chicken but that did not make any difference. We brought them home, placed them in the nest and the motherless chicken became a proud mother a few weeks later…it was interesting because all the other chicks and chickens are black/brown/red except for her babies which are white. Wish I knew more about chickens because something cool took place there. I love that story, Chef! Everything looks so amazing! What adventures. xoxo to poor Ollie! Thanks Nina. Ollie says xoxo back. I like every season. I’m loving spring weather right now. Life on a farm sounds so interesting and fun to me. I bet there’s no dull moment there. I like to eat homemade bread with butter :). Wow! You have a lot of greens your way. Our winters are hard up here in Canada. Springs are slow, too. Your dog, Ollie looks a lot like Sheba. Good luck with the eggs! Hope you don’t get this twice. I had trouble commenting here. Aaaah. . . SPRING! Such a relief — most of the time (& in most of the country). This year, we are in Arizona, where it is way too warm, way too fast for my Washingtonian self. I do wish it were a touch cooler; I won’t lie. Oh, you should have seen those gashes when they were bright, tender red! Poor Ollie, his tail never did stop wagging! He is an amiable fellow. I have a broody chicken story too. 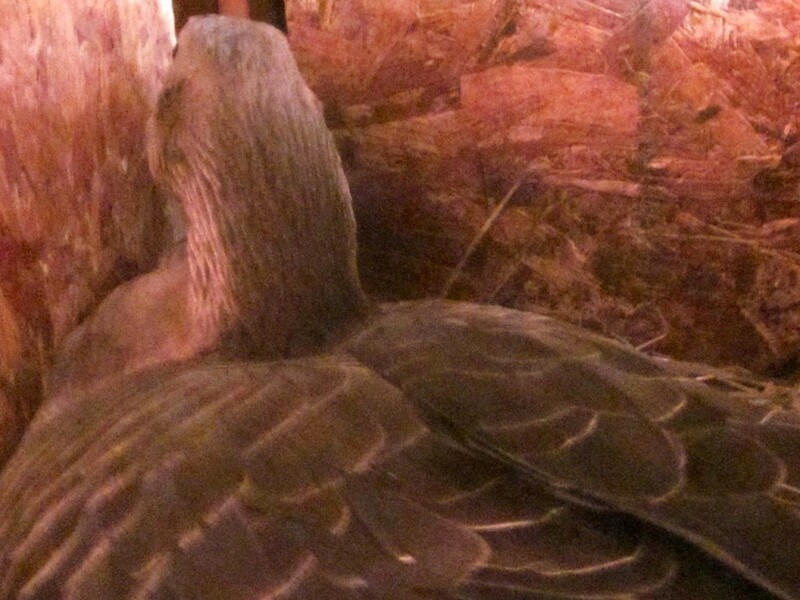 A couple of mine went broody one time, sitting on an empty nest. So I put a couple of egg-shaped rocks under them, then when Chick Days came along, and went out and bought two2 day-old chicks. I put these under the hens while taking out the rock, and everyone lived happily ever after. Those mothers were practically purring. It was so sweet. Jeanne, I’m so sorry that you lost your comment. I hate it when that happens! I love your story about using the rocks, and then doing a little switch = instant family! I’m thinking about trying that with one of my broody hens, just to see .. . ! 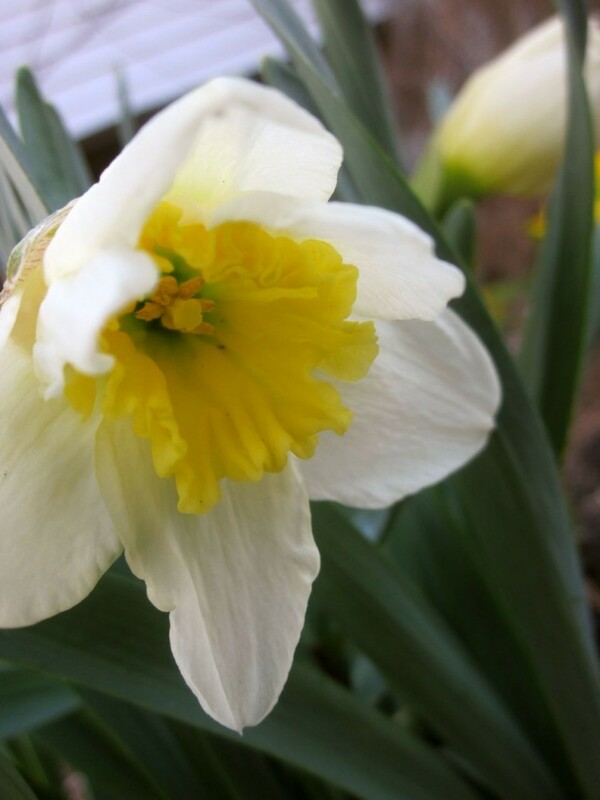 I loved your flower pictures – and, oh yes, the pictures of the goose Lucy with Little Mack and Amalia, and yes, the pictures of poor old Ollie, and also the pile-up in the nesting box! Oh well, I just loved them all. I, too, am enjoying the spring, which has definitely sprung in Texas! My plants are pretty much ready for the gardens, going from little seeds to beautiful vegetable starts – tomatoes (lots! ), peppers, Roselle, Jelly Melons, beans are sprouted, and lots of poppies this year. The rest will be direct sown. Yes, I love the spring! I love the roses that are beginning to bloom profusely and smell so wonderful and the promise of rose hips for teas and stuff. 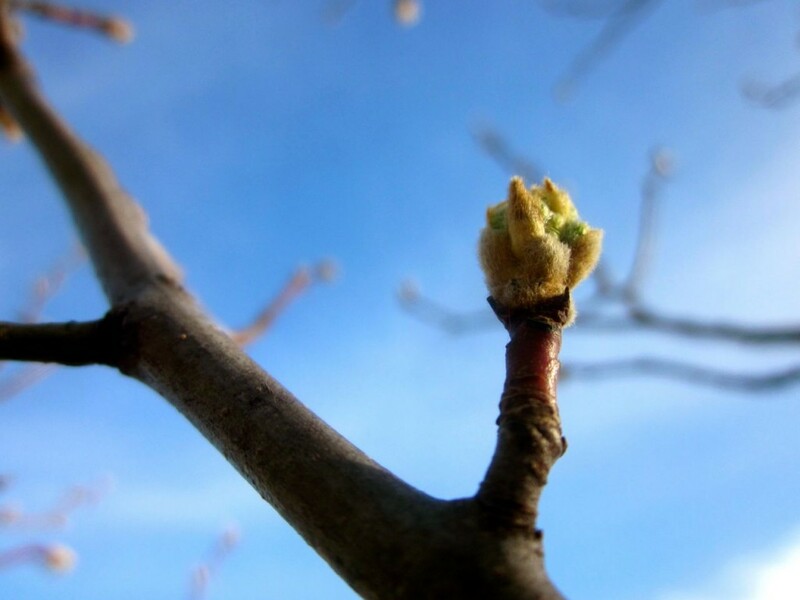 Everything is in bloom including all the fruit trees and even the grass is beginning to look green again. Yes, and the weeds are profuse! We are so blessed to have God provide us with all the eye candy that will turn into food for our good health and food for our little ones – the chickens! It’s always so nice to hear from you! It sounds like you’re WAY ahead of us in Texas. We finally had a bit of rain this weekend, and it greened everything up very nicely. Thank God for color! I do love the freshness that Spring brings. It’s such a relief after having to endure winter. I cannot believe how quickly this year has gone though! We had two female geese that sat some chicken eggs and they made great mothers to the chicks. We have also put duck eggs under them. The only problem is that you can never separate them. We tried putting the chicks in with the hens when they were about 4 months old and they would run back and forth at the fence line crying for the geese. So the geese would sit beside the fence till we let the babies back out. It was so sweet. When I was raising the three geese that we had originally, they imprinted on ME, Amanda, and they didn’t like it when we were separated! Evidently geese attach themselves for life!